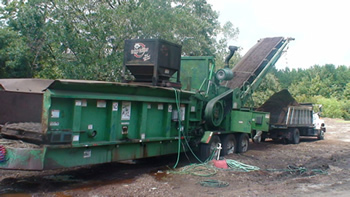 Bandit Industries founded in 1983 is one of the largest manufactures of wood recycling equipment world-wide. Over 60,000 machines have been sold all over the world and are used in all climates. The main headquarters is in Remus, Michigan and specializes in waste wood recycling and chip coloring. They also build stump grinders, chippers, horizontal grinders, forestry mowers, bio-mass, and whole tree grinders. Our Bandit 3680 Horizontal Grinder built in 2000 is now being sold for parts. The 3680 Grinder recently caught fire, due to a fuel pump gasket which was incorrectly installed. We have many good parts on this machine which we are parting out and selling. It does have a Cummings 475 hp engine. The engine serial # 12005920, it has Twin Disk Friction Clutch which is relatively new and is set up for Radio Remote Control. I have several different screens available for this machine. From a 3 in trash screen to a 1 inch fine mulch screen. We primarily used our Bandit 3680 Horizontal Grinder to process landscaping debris and then used the Color Critter to color it into Mulch which we then resold into our landscaping business. It does have the magnetic head pulley which is used for removal of metals and nails. About 1 week prior to the fire we had put new cutter bodies, teeth and a rakers into the machine. So the cutter mill is basically unused. I have been buying parts for the Bandit 3680 over the years. We started with the machine in 2007. The Color Critter build by Design Corp. is a Dry Colorant system that uses granular pigments to color wood products for mulch, with the addition of water it creates nicely colored mulch. The Color Critter meters granular coloring onto the conveyer belt. Usually the product has already been mulched one time and now being sent back thru for the coloring process. It reads the belt speed and adds or reduces the colorant depending on the infeed speed. When the auto feed stops the belt the colorant stops coloring. It can easily be removed from the machine with a pair of Forks as well as you can leave the machine on and remove the hopper to refill the colorant. We bought the Color Critter new in 2009. It was used on the Bandit 3680 Grinder which we are now parting out, but would fit on most any horizontal grinder. 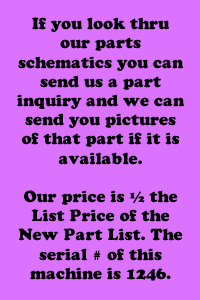 If you look thru our parts schematics you can send us a part inquiry and we can send you pictures of that part if it is available. The serial # of this machine is 1246.